It’s a never ending quest, isn’t it? I mean why else would we all have so many different pairs we barely – if ever – wear? They’re too long. Or too short. Too tight. Or too loose. Or just don’t feel “quite right”. And they STILL don’t feel “right”. AND what’s more, we feel guilty. Of our ever growing stash of unworn jeans. They don’t feel right on. And they don’t feel right cluttering our closets. Because in the stores and online and in the media we are constantly bombarded by NEW choices. And we fall for it all over again: this time they WILL feel right. Especially if we buy THREE pairs on offer!!! Because bottom line it’s all a bit of a con isn’t it? The promise of the PERFECT jeans. The PERFECT bag. The PERFECT shoes. The PERFECT jacket. It keeps us shopping and shopping and shopping for stuff that NEVER satisfies us. And becomes clutter – yet more of it – the moment we get it home. 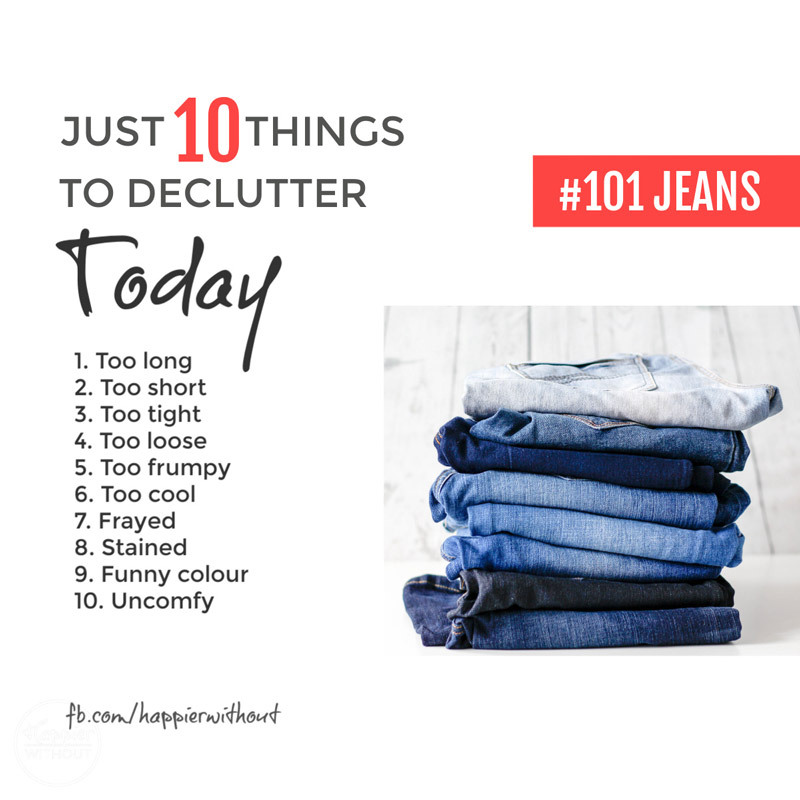 So today we’re going to LET GO of the jeans we never wear. Say a big YAH BOO to too much choice. The good news is: jeans are easy to pass on. They can go straight to a charity shop or in a charity collection bag. (We’ll be letting go more clothes the next five days so you can bag them all up together). AND by passing them on, we’re doing some good. Because jeans it turns out guzzle water. It takes a whopping 7,000 litres of water to produce ONE pair of jeans. And the cotton for most jeans comes from places struggling more and more with drought and water shortage. So the more everyone buys vintage jeans the better. Not least because the MOST comfortable jeans are often NOT new.